Vinegar is great for cleaning without the harmful side effects that go along with using harsh cleaning products. There are so many uses for it that you'd probably never even think of! One of my favorite things to use distilled vinegar for is upholstery cleaning. I like to spray it all over the furniture every now and then to kill bacteria, BUT it stinks. It literally stinks. 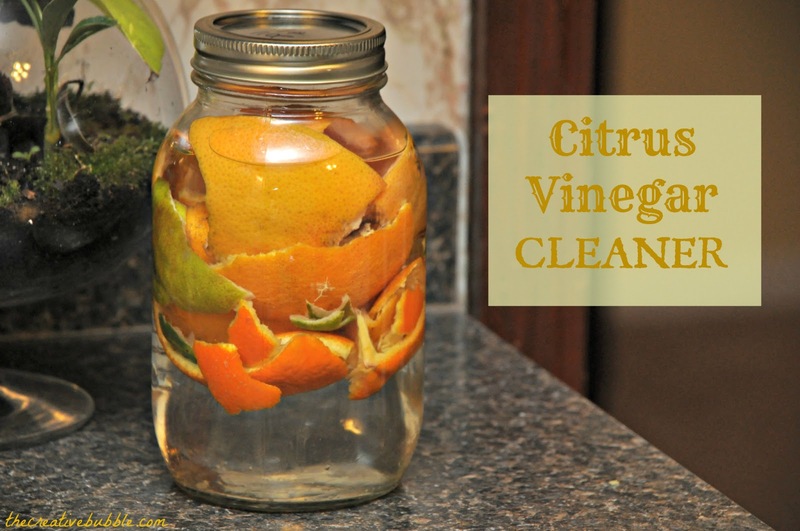 Here is a little trick to make your vinegar cleaner smell like citrus instead of straight vinegar. peels from lemons, limes, oranges, tangerines, grapefruits, etc. Fill the jar about halfway or more with the citrus peels. Then, pour the vinegar in until it is full. Seal the lid tightly, and allow it to sit for two weeks. (Do not leave the peels in for too long or the cleaner will become thick and sticky.) Remove the peels, then pour the cleaner into a spray bottle. I use mine all the time! I chose to use lime, grapefruit, and orange. I would have filled the jar with more peels if I had more on hand when I made it. This definitely smells better than straight vinegar! Think of how much money you can save by using this natural and effective cleaner to replace several bathroom and kitchen cleaning products. One even easier way to make this natural cleaner is by using dōTERRA's essential oils. It would be wonderful with a few drops of lemon eo, wild orange eo, grapefruit eo, citrus bliss eo blend, or lime eo! I love this idea! I am definitely going to give it a try!